Wild Goose © 2003 Aristocrat. 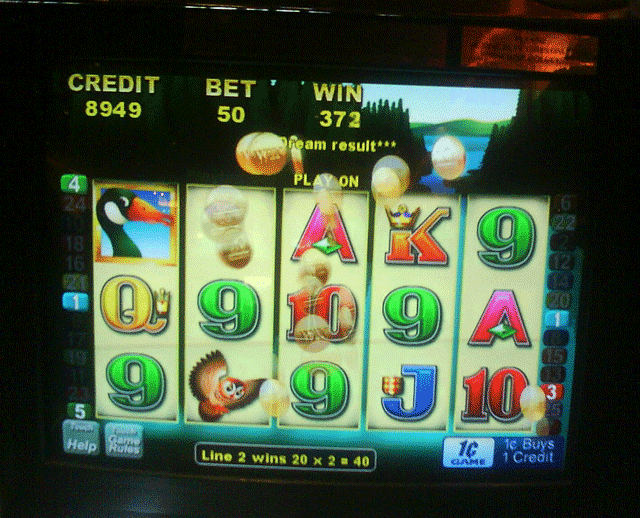 A video slot machine with 5 reels and 25 lines. This game is similar to the "Dolphin Treasure" series, but the feature is different as it gives you the choice of 3 different features. Insitead of getting 3 scatter symbols you have to get 3 (or more) Eggs and/or Wild Geese which substitute for the Egg. The Egg is where the Starfish would normally be on a "Dolphin Treasure". The Bingo feature gives you a standard bingo card with 25 positions. The centre number is filled in already to start with and there are bonus items such as x2 in some places. The computer will then randomly give out numbers until 5 numbers are in a line on the bingo card, which you will win the total credit amount that adds up on the line. The Free Games feature is identical to the "Dolphin Treasure", as in 15 games with all prizes tripled. The interesting part is gives you all 25 lines regardless of how many lines were played. If you play 1 line and get the 3 eggs across the middle the pays aren't as big as if you played a multi-line (say 10 lines) game to get the feature.